If we look at these two different aspects of mind we see that that which is aware, that which is looking through our eyes, listening through our ears, that which is hearing and feeling and experiencing now, is timeless. It is open like space. It is radiantly clear. It has no limit or end anywhere. Something which is like open clear limitless space of course is not bound inside time. It is not limited by time and place. But if we look for the true nature of that which is aware, which is experiencing the world right now this must be seen to be timeless and limitless. Our own clear space and mind is without birth or death. It is however very rarely that we experience our timeless nature. It is very rarely that the mirror is aware of itself and the mind sees its own nature. Usually we are caught in the things coming and going in the mind. We are not seeing the ocean. We are seeing the waves which come and go there. The few times when the mind experiences itself are the moments of greatest intensity and joy that we can imagine. The way that the radiance of the mirror is actually more than the images coming and going in the mirror when the mind experiences its own nature are very powerful, very exciting and unforgettable. People may tell you about the clear light. 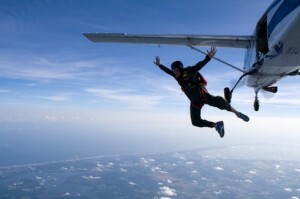 They may tell you about the peak experiences before the parachute opens in free fall or something like that. You may actually also have had moments where you forgot to expect anything or fear anything or live in the past or live in the future, where there was time when nothing else was in the mind. Suddenly you became exceedingly joyful, totally secure. You found yourself to be very powerful, very kind. You saw suddenly that the experiencer itself, that which is aware, really had some lasting qualities that we usually don’t see. Sometimes we know who is calling before we lift up the receiver and that means that the nature of the space of our mind is information. When we get happy on the inside for no outer reason because we forget to hope or fear or think of anything, it shows that the space of our mind is joy. When we are kind and compassionate without thinking that we are doing something to somebody else but simply because they are not separate from us and there is nothing else to do, it shows that the space in our mind is kindness and unlimited love. Even though we may have experiences like that for a few moments in this life most of the time we are constantly caught in the things which come and go. We are in the pictures in the mirror, not in the mirror. We see what changes all the time. Seeing this then, different kinds of feelings will appear, attachment and aversion, likes and dislikes. Hope and fear will follow most beings during their lives. Instead of being here and now in the truth and the intensity and the meaning of what happens in every moment, recognising it to be true just because conditions come together like that, we are thinking of the past, of the future, we are somewhere else. Doing that we experience the human life. The Buddha tells us that there is no one thing which stays the same during this life, not one single thing. The open clear limitless space is the same in everybody. It never changes, is not born and doesn’t die. But the pictures in the mirror, the stream of experiences, even though they seem to be similar, are more like a stream of water that flows all the time and new water is there in every moment. If we really look we see that in the boy of seven and the man of seventy there is no-one who has stayed the same. There is not one single personal thing which stays the same from one moment to the next. All things appear, change, disappear again, are born and die and come and go. On the other hand there is relative continuation because if there was no child at seven there will not be a man at seventy. So we see that even though no experience of the body or mind, no molecule, no atom stays the same from one moment to the next, still there is this continuation. One thing brings about the next and becomes the cause of the next thing again. Things move in a stream like that. We are aware of this stream. We are aware of three so called Bardos or intermediary states while we are living here. The Tibetan word Bardo, which is quite well known, actually means something which is between something and something else. For instance, if I haven’t bored you too much now you are all in the waking Bardo, the Bardo of being awake. After some hours you will fall asleep and you will be in the Bardo of sleep . While you are in this Bardo of sleep you will have certain dreams. Each of these things are intermediary states. They are states that follow one another all the time. After a waking state comes a state of consciousness and inside this again is another state: the dreaming state. And this is what we are used to now. Every twenty four hours, if our lifestyle is not too extreme, this is what we experience, these three Bardos. But there are three further ones, which we only experience every time we die. There is the process of death itself, there is the thing that happens after death, the continuation of the experiences of our last life and then there are the new experiences as our subconscious starts to go into the shape, go into a certain structure which then leads into our next birth, our reincarnation. And, before I tell you the whole process as it happens I should tell you my credentials for telling you this, why I can sit here and actually tell you this. 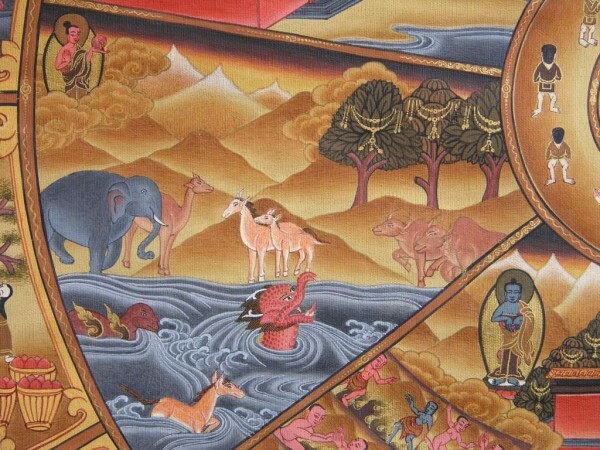 You probably know that in Tibetan Buddhism we have many incarnate Lamas. We have many teachers who are recognised when they come back. They are clearly the continuation of a stream of consciousness of a former teacher. Nearly everybody knows the Dalai lama. Actually the first Dalai Lama was a student of a student of the fourth of the Karmapas, who were the first incarnate Lamas in Tibet around 1110. 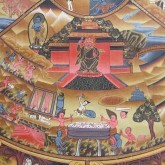 And among all the incarnate Lamas in Tibet and there are about 110 special ones, he is the first one to actually start. His first one was in 1110 in Eastern Tibet and he is also the only one who, before dying, writes down every detail of his new rebirth, so other Lamas don’t have to find him, they can actually read the letter he has left and then they can go out and find the child. That child then has unbroken consciousness and memory from his last life that he has brought over. 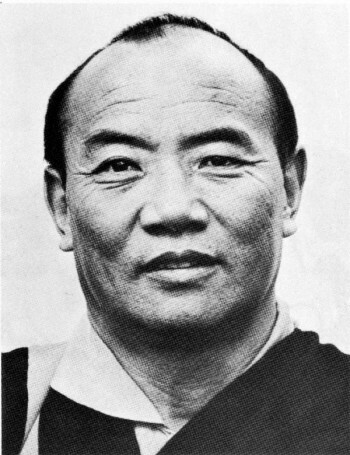 So that’s one reason, being a student of this Lama and having his teaching is one of the reasons that I can talk about this with confidence. Another reason is teachings by other great teachers like Guru Rinpoche who gave these explanations. 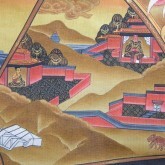 He was the Lama who brought who brought Buddhism to Tibet around 1250 years ago. And the third reason is that I myself am a Phowa Lama. Phowa means conscious dying. I teach conscious dying. So far I have taught 20000 westerners how to die consciously. Its not an academic study, its not something I’m telling you about that is abstract. People accept that when they have the physical hole in their head. When through meditation they have actually knocked a physical opening in the top of their skulls without even touching their heads. Many have actually also experienced leaving their bodies during this process and entering realms of great bliss and great joy. Some people really lose their fear of death in the process. The biggest courses are always in Poland, Russia, Germany and Central and Eastern Europe, but I’ve taught it here once. Its a process that takes about three to four days with the instructions and everything else and the result is that you actually come out of your body. You sent your mind out of your body. I mean you get a real physical sign and you also of course have many mental transformations. Its a teaching which as far as I know is practiced in a few places such as Burma but among the Tibetans in the old schools in Tibetan Buddhism it is quite widely known. The word Phowa means ‘a bird flying out of a skylight in a roof, this is actually the meaning of it. I have also had the experience of beings who were dead coming to me. They were there as real as you are here today. For all these reasons I am telling you now with confidence, I am not just repeating what I have read in a book or giving a summary of some other teaching. I am totally convinced of what I am saying here myself. So, what happens in the process of dying is always the same. If we look at the death process from the outside it may look very different. Death in people who step on a mine or get hit by a fast car looks very different from death in someone who dies from Aids or Cancer in a hospital somewhere. It doesn’t look the same at all. But actually what is happening is the same process. What happens is that the energy which used to be spread all over the whole body begins to draw into a central energy channel inside the body. There are different kinds of energy and maybe I should say a little bit about that also. We are all Western educated so we know about nerves, those yellow strands going through the body, sometimes thick then thinning out more and more, contracting muscles and bringing information. They work with electricity and a hormone called serotonin. Then some of you who are Asian probably know about acupuncture and acupressure, where for example, you put a needle in a finger and it brings a flow of energy and some more awareness to your kidneys or heart or liver or something else. There is this outer flow of energy which follows different meridians to the inner organs. Then you have probably also heard the Hindu word kundalini where they talk about the nervous energy which is in the spine. In Buddhism we work with the central channel which starts four fingers below the navel in the centre of the body and it rises to a place eight fingers behind the original hair line on the top of the head. It is said that this original energy line or energy channel appeared when the egg and sperm met in the womb of our mother. At that time the egg had an energy which in meditation is experienced as red and the sperm had an energy which is experienced as being white. The information in these two cells created the billions of cells which form our bodies today. The red energy moved down to four fingers below the navel and the white energy moved up to about eight fingers behind our original hairline on the top of our head. Between these two then is the central axis. It activates itself at five places. At the head thirty two channels move out and activate the brain centre. They have to do with the body, everything physical, everything sensual. With speech there are sixteen channels which fill the throat. With the heart there are eight channels which became many channels and cover the upper body and have to do with intuition and feeling and so on. At the navel there are sixty four which spread out and go into the legs and cover the lower body and which have to do with qualities such as artistic abilities, creativity and so on. Four fingers below the navel there is our power centre which the Chinese call Chi which can be sexual power or ordinary physical power. What happens in the process of dying is that these very spread out networks of energy begin to draw into the central energy channel. The different wheels collapse. The experience we have on the outer level is that our sensory experiences become less and less. We see but we are not quite sure who, we hear sounds but its more like mumbling. Its not distinct. We feel something but we are not sure what it is we are feeling and actually our whole contact with the outer world begins to disappear. While this is happening we are also having some inner experiences. We begin to get confused and begin to drift in and out of consciousness. It’s difficult to focus and be aware. At the same time we also have some physical experiences. First, is the feeling of pressure. That is the solid element moving into the water element. Then there is the feeling of flowing. That is when the water element is moving into the fire element. Then there is the feeling of dryness. Step by step as the mind begins to withdraw from its physical bases which are the elements of solid and fluid and heat giving and airy moving and finally space itself and consciousness. Then we float and start getting cold and our consciousness begins to disappear. 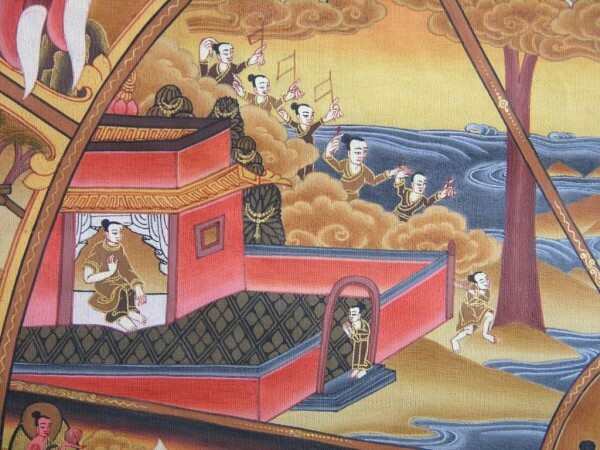 During these different processes which are really the process of death, all the energy comes into the central channel. And here at a given time we breathe out three times and the third time we forget to breathe in again. Here people say now this is death but actually we say as a joke sometimes that if people can afford a few days more in a hospital people will come and put electrodes on their hearts and give them a shock and then they will go on for a while longer. Anyway even if we do hook people up to the local electricity works, after a while they do die. Everybody dies. So at the time when one dies, after the taking in of oxygen and the exchange of energy with the world outside has stopped, there is a twenty to thirty minute period where the inner energies stop moving. What then happens first is that the white energy from the top of our head gradually begins to move down through our body to the heart centre which is in the middle of the body, not to the right or the left. On the way down there thirty three kinds of feelings which come from anger, which are usually based in anger, disappear. We see a very clear light like a very clear moonlight. Then after that about ten or fifteen minutes the energy begins to move up from the lower centre, the centre below the navel. 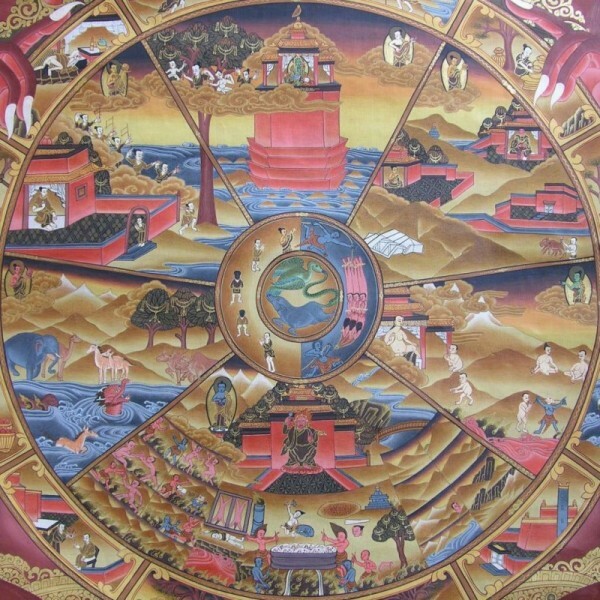 As this begins to move up we actually experience red light like a setting sun moving up and forty kinds of feelings which were caused by attachment and greed disappear. And when twenty to thirty minutes have elapsed after we stopped breathing, these two energies come together in the heart. First everything becomes dark. This darkness is where seven kinds of feeling based on stupidity disappear. Then after that we experience an intense clear light. This is all the awareness, all the energy, everything that used to fill our whole body. This is now in the heart centre. Everything has met there. This moment is actually our best moment for enlightenment. If we can hold this state, if we can be aware twenty to thirty minutes after death that this clear light is our true essence, that this is our awareness, then we can do what many great saints have done during this last time over the last two thousand five hundred years. Here I would like to give an example from my own direct experience. It was when the sixteenth Karmapa died in 1981. A year and a half before that in 1980 he had told me on which day he was going to die. I met him on the solstice in Colorado in America. He told us to come to him on the first day of the eleventh month next year. He said that we could also bring our friends. So we came out to seek him in the Himalayas. He wanted to die in the West where scientists could examine his death processes. Five days after his death his body was still warm and supple. He was then put into the meditation position surrounded by a lot of butter lamps. He stayed there for forty five days until the19 of December when he was taken from his meditation seat. He had made his body very small. They put him in a box with a window that you could look in. Most people didn’t want to look but I did because I knew that I would have to tell the story. I knew it would be my job. His head was smaller but not much smaller but his whole body was like that of a child. This man had been bigger than me. He was a massive big boned Tibetan from a warrior tribe, a big strong man. When he was burnt the next day there were outer signs, a double rainbow around the sun, which is very unusual in Sikkim. There was also an enormous eagle that kept turning high up around the burning place. When his heart came out of the oven it rolled down to the students. There were many other things that happened that were very unusual. This is a case of what you call Thukdam. 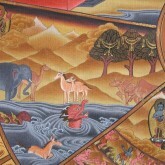 Thuk is the Tibetan word for heart or deep mind and dam is bond. It is where one is able to bind the consciousness in the heart. If one is capable of doing that and holding that state then one can do all those things. Other things also happen when teachers and Yogas and Lamas die. They sometimes change the whole vibration of their bodies from solid to energy and they only leave their hair and their teeth and their nails which have no nerves and which cannot be transformed. These things are still happening. But if one transforms everything like that it is more difficult to be reborn because there is nothing physical to pull one back again. It is always difficult for high incarnates to come back because there are so many things pulling them in other directions and only other people’s problems to bring them down here again. So this was an example of somebody really capable of staying in the clear light of the mind, in the state called Thukdam. 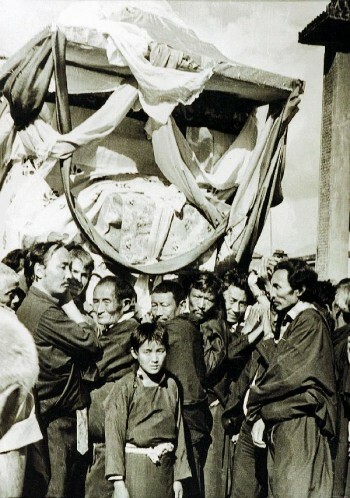 If you use meditations where you concentrate on Buddha forms disappearing and you concentrate on being aware without being aware of anything, concentrating on just naked awareness, totally conscious without having to be conscious of anything, just having awareness in its own state resting like that, then that is the kind of meditation which will develop into the power of staying aware as you are dying. It is a period where awareness and energy and space inside and outside are no longer separate, where one’s mind, where awareness, clear light is the same inside and outside, where there is no difference between enlightenment here and there. It’s just like space and awareness, inseparable. If one is not capable of holding that state, and the normal taxpayer does have difficulty holding that state, then one becomes unconscious. Here the text usually says that one is unconscious for three and a half to four days. My own experience is that every time people who died came back to me it was exactly sixty eight hours. It happened with my mother and a few other times also. I don’t know what meaning it has but I know that when they are there as close as you are, it’s very clear that they are there. Every time checking afterwards it was 68 hours. So it may be that modern big city people, very intellectually trained people and so on, go through some processes more quickly than less neurotic farmers or people like that. Anyway, this has been my own experience. Then when one wakes up from this state of unconsciousness, then usually one does not know that one is dead. If one’s death process has been very long, if one has been dying for a long time one has some idea but if one has just been hit by something and has had no time to prepare then one really has no idea. One is also confused because one has no solid body and that means that wherever we think we are then that’s where we are. If we think England or India or Thailand or Burma or Cambodia or Denmark, whatever we think, the moment we think it our awareness is there because like space and awareness, there is not anything to move. Its also a difficult situation because nobody can see us. So we try to make contact with people. We try to find out why all our friends are unhappy and our enemies are happy. We can’t really understand these things. Any time we try to talk to them they walk away and when we sit in a chair they come and sit on us and so on. It feels very strange. After about a week in this state and that means about ten days after we died, then mind really faces the fact that we are dead. Then we really understand ‘Oh I must be dead.’ Here again if you meditate on the process where after a meditation everything arises as a pure realm, everybody is a Buddha, you are a Buddha, every thing is a pure realm, that aims for the second phase, the phase of waking up again. An ordinary person who is used to seeing the world in an ordinary way will in that situation see ordinary things everywhere, while somebody who is trained in this process of having the whole world appear as a pure land and seeing Buddha nature everywhere, will at that time when one wakes from the shock of dying, again see Buddhas and pure states of mind and one will run there and do what the Tibetans say, change bodies with the different Buddhas. It is like a child seeing her mother and running there. When we see these different Buddha forms that we are used to meditating on, we run there and we mix into them and we enter their mental level. 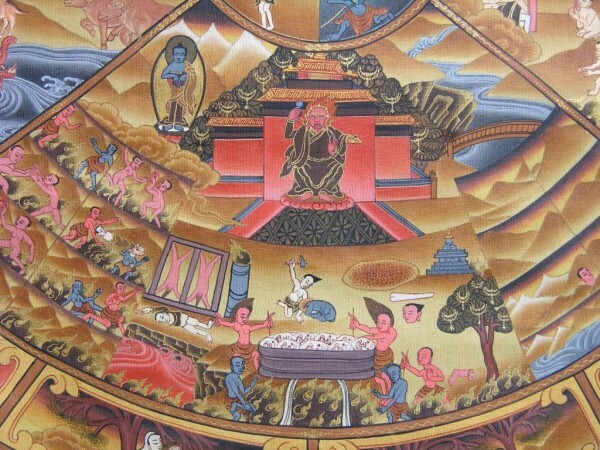 This is not the state of Dharmakaya or the state of highest truth. 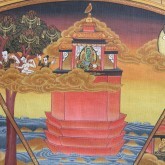 It is a state of Sambhogakaya. Its a state of blissful joy and richness of the mind. But this state is also without any kind of falling down or suffering again. If we don’t make it to that state, then, as I said, mind will discover that it is actually dead and this is such a big shock that we become unconscious once more. When you wake up from that unconsciousness then the stream of experiences from the last life has been broken, the stream of experiences from the last life is over and now our subconscious begins to come up. The things that were planted inside, the pleasant, the unpleasant, the friendly and unfriendly thoughts and feelings now come up because no new impressions are coming to the mind from the outside. There is no new sensory input. All the subconscious things start coming up and depending on what is the strongest tendency inside us then one out of six worlds begins to predominate. For instance its possible that we’ve done a lot of good things but we were also aware that we were doing them. In that case of course we fill the mind with good impressions but always thinking “I do this for you”. We don’t remove the separation between us. We don’t remove the things that block us. Though the things are positive and give good dreams, they don’t make us wake up into the experience that everything in the the open clear space is the same. So, if we’ve done that, if we’ve filled the mind with good impressions but still think that I do something for you, then the result is what we call the Gods’ world. 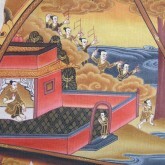 Buddha tells us that there are six levels where we experience spontaneous joy, all desires are spontaneously fulfilled. There are seventeen levels where we experience aesthetic joy, like beautiful sunsets and fine art and so on, and there are four levels where we experience abstraction. 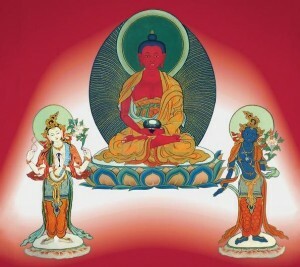 Buddha called them Arupadhatu, Rupadhatu and Karmadhatu, that is, the formless, the formed and the desire worlds. These three are the psychological states that we enter if a lot of positive Karma is there but we still believe that there is a me doing it for you. Then there is also another stage which is much less pleasant. That is if jealousy is the strongest feeling in us. Then in that case we reach what is called the half-god realms. Half-gods are not having such a good time. They are always jealous, they are always fighting to get what others have, they are always experiencing looking for weapons and so on and they are not experiencing joy. They also get hurt more easily than the gods. The gods’ minds function in such a way that they only think that they die if their heads are cut off. But the half-gods also think that they die if they are shot through with an arrow. So their minds work differently. Also in these half-god states beings are usually very angry and in those states when they die they really fall down because their minds are charged with negative impressions, anger and hate. Then there is also the possibility that the mind has really clouded its potential. This can bring about a situation where one is so confused when one dies that one tries to hide between rocks or in bushes and here one can actually appear the next time with four legs and a nice fur coat. It’s possible for mind to unite with the animal body at least for one life. I know at least three cases in my own experience, for some reason always with big yellow dogs, where they have come right up to me, put their paws on my chest, looked into my eyes and mentally said “What happened? Suddenly the light went out and now I’m in this state.” One dog in Malta was actually following me all the time. It was so embarrassed about having that body. It was really a contact. I won’t say that it happens often. If we look at the world there are so many miserable and poor and suppressed and suffering human lives that one doesn’t even need to become an animal to suffer today. Look at Africa and South America and so many poor parts of the world where people have nothing. In my own experience I have made contact across that barrier and it does exist. It’s possible that greed and avarice have been the strongest feelings. At that time the desires, wishes which were always tormenting us, concentrate on food and drink. There again, beings may have very strange experiences. They may have the experience of having a very small mouth. Whatever one tries to eat is very difficult to get down. In this dream state one is in a body as big as a town and it’s impossible to get what one needs. There are other states where one experiences outer hindrances, where whenever one reaches for something then some demon or disturbing influence always takes it away. Or, things become fire and burn us and so on. Finally, if we have mainly charged the mind with anger and hate, then the result is paranoia. When the subconscious impressions come up from the mind the mind cannot stand them and the main feelings then are cold and heat. 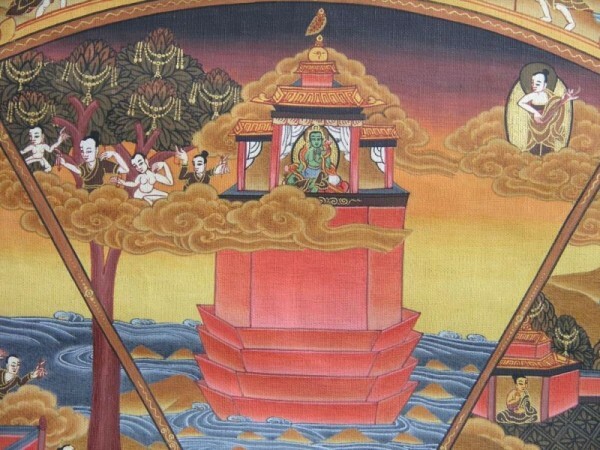 Buddha tells us that there are eight levels of feeling extreme cold and eight levels of feeling extreme heat. Then there are also stages which come from time to time like when people suddenly start drinking like mad and destroy their lives once or twice or four times a year, make a shambles of their lives and then gradually they have to get together again. Actually we can see it all if we look in a mental institution or at human beings living in extreme situations. All these things can happen while there are physical bodies. We see human beings experiencing all these things in different places. All this can happen even more strongly when there is no physical body. Right now if one is depressed or unhappy one can eat pills, but when we die there is no body to distract the mind. The experiences are very strong. So for that reason Buddha really advises us to do, think and say useful things. Otherwise we create problems for ourselves. These other realms, even though they may be experienced for a very long time, are realms where one gets rid of karma, where one works out karma. If one is in the god realms one is spending the money, the good energy one created. If one is in the paranoia or suffering states one is working off one’s debt. But the place where one comes back to the really important place is this human life. If we return to a human life then seven weeks after dying we find some parents making love and we go down from the top of the fathers head and follow his sperm into the mother. We wait until the sperm and egg meet and then a new life starts. Or, we go from this life into one of the other pleasant or unpleasant states. But after some time again we reunite with a human life like this and this human life is where the most things can really be done. Here we have a physical body. We can understand that things are positive and negative. We have very strong feelings, desires and attachments and expectations. If we look at the continuation of our last life or this one then the first thing to consider is what happens after we die. What structures come up, where we go. And then when we are reborn human again there are three more results. First there are many kinds of human birth. Australia, North Europe are some of the most pleasant places one can be today. So, there is the place one is born. One can be born in a place where there is collective good karma, where the poor are taken care of, where there are transparent political processes and where one can be free to have a useful life to develop oneself and think of others. Or one is born in a place with a lot of suffering, oppression and hunger, which is actually the majority of the world. Then there is also what kind of body we get. We may get a body that is healthy and long lived, brings joy and is popular, or we may get one that is sick and not functional, is short lived and has many problems. And the third thing is the tendencies we have, that is if we naturally like to share, if we like to be good with others, if we like to benefit others, or if we like to put others down and stand on them and suppress them. 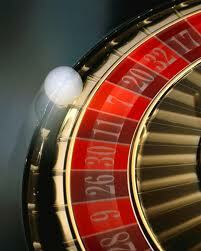 After that next life when we die, the whole inner roulette starts again. The outer impressions disappear then once again, we get into new states. 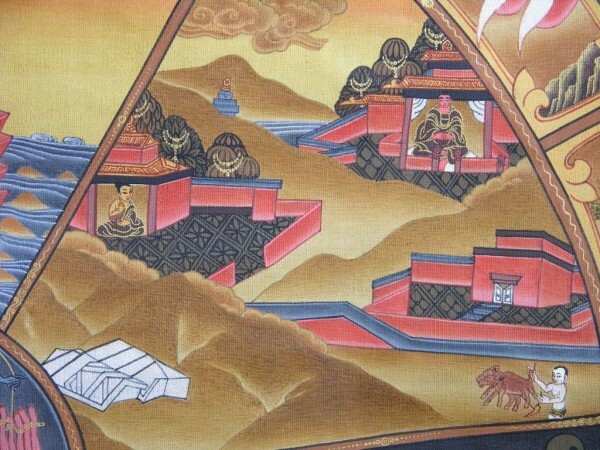 Buddha tells us that there is no beginning to all this. He says that mind is like space and space has no beginning. Mind has been timelessly playing with itself, expressing its qualities, experiencing, producing situations inside and outside. And there are many more births in states of pain and suffering than in states of joy and bliss. Even when we are born here as human beings as we are now in a nice country, healthy and so on, still when we were born we didn’t smile when we came out of our mothers, we screamed because it hurt. Some day we will get old, sick and die. While we are here in our best years like we are today, we are always trying to get things we like and avoid things we don’t like. We try to hold onto what we have and arrange ourselves with things we can’t avoid. In all conditioned states no matter where we are there is either the suffering of everything collapsing and landing on our heads or there is the suffering of things being impermanent and changing and being unable to hold them, or there is the suffering of being ignorant, of simply not knowing, of hardly remembering yesterday and having no idea about tomorrow. That is why Buddha is always advising us to shift our values from the bank that gives less and less interest because our life is getting shorter and we cannot take things along, to the bank that gives more and more. To shift our values from things that change and disappear, that are born and die, that come and go and shift them into something which is timeless and cannot disappear, something which is more joyful, more happy, more powerful, more compassionate. And that basically means shifting our values from the thoughts and feelings and projections of the mind into the open feeling of the space of the mind itself. It means to try to rest in our awareness and doing that, see the one who sees and not just do the things that are seen, trying to be aware of the one who is aware. We will see three things that will make us very joyful. First we will see that that which is aware is not a thing. That is, it has no colour weight smell or size, it really like space. And recognising that it is like space, we do become fearless, I mean really fearless. Nothing can disturb us. Nothing can hurt us again. Being fearless, we can see that everything is interesting because it happens, because it shows the qualities and the abilities and the richness of the mind. Finally we can see that other beings are like us. They want happiness, want to avoid suffering, and that their mind is like clear space. And then we become loving and kind. So actually all these different qualities, all these different mental tendencies are really important. We saw quite a few of them demonstrated by a red-headed policeman on our way into Canberra. He stopped us for doing 90 kilometres per hour in a 60 zone, and he was actually completely happy that while he had to book us to keep up his quota we were going to leave the country and nobody would suffer. This feeling of sharing and being with us was a really wonderful human reaction. These tendencies exist everywhere in everybody and everybody can bring them out. There is something seeing and there is something being seen. There is a mirror there. This entry was posted on Saturday, September 11th, 2010 at 7:09 am and is filed under Diamond Way Buddhism, Lama Ole Nydahl. You can follow any responses to this entry through the RSS 2.0 feed. You can leave a response, or trackback from your own site. 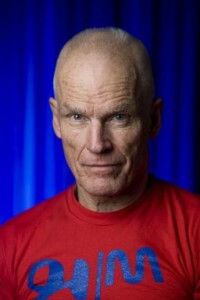 Does Lama Ole Nydahl ever give teaching in Hawaii? Maybe contact the friends there and ask when Lama Ole will next visit?